We are anchored off Fort Hancock, NJ, in the protection of Sandy Hook (map). It's an unplanned stop after an eventful couple of days, and, honestly, I was expecting instead to be posting this update from an airplane this morning on my way to North Carolina. Shortly after my last post we arrived in the harbor at Port Jefferson, just behind one of the endless ferries from Connecticut. We found a spot just north of the mooring field (map) and dropped the hook. We splashed the tender to head ashore for a look around and some dinner. Port Jeff turns out to be a cruiser-unfriendly place. We heard stories of the sheriff chasing off boats anchored too close to the moorings (we had no trouble), and it was difficult to get ashore. The town has a pier with a float that looks like it should be for dinghies, but the pier itself (not the float) has numerous "no mooring" signs, and the whole pier is locked at sundown, making a dinner stop at this time of the year impossible. This pair of mute swans came over to the boat several times looking for handouts in Port Jeff. We called the municipal marina to ask about a dinghy tie up, and they emphatically told us they had none. The boat ramp is part of the marina so that was out, too. Ultimately we ended up paying $10 to tie up the dink at the private marina next door, Danford's. The $10 would cover us for 24 hours, even though we only needed perhaps two. We did enjoy our stroll around town, which is very waterfront-touristy in a way designed mostly for landlubbers. It's also very tony and very expensive. We ended up eating at an Italian joint, Ruvo, a few blocks inland which had a good happy hour and a nice Monday night special. It would be nice to spend another couple of nights here, but not at $10 a day to land. 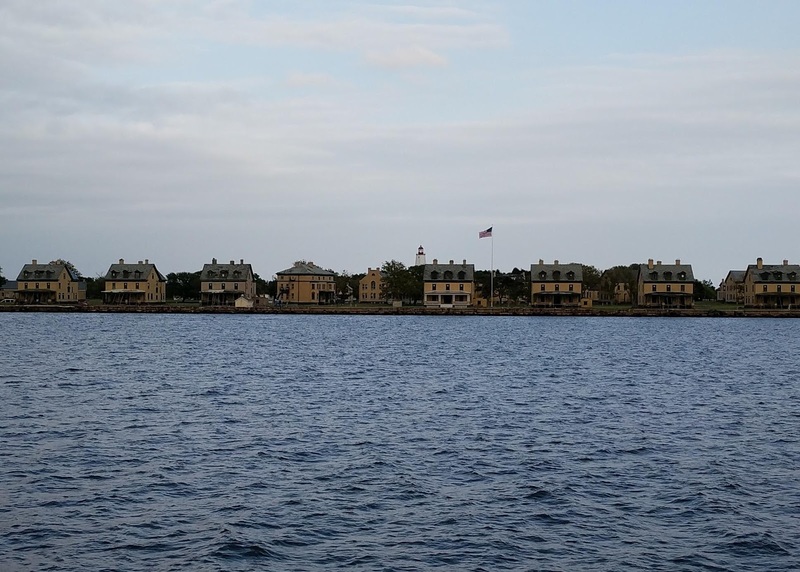 Tuesday we weighed anchor and steamed the 35 miles to Manhasset Bay and Port Washington, a familiar stop for us. It was an easy cruise in open water, and in hindsight I probably should have posted an update here under way, but instead I caught up on email and did some more route planning. I also phoned the Port Washington harbormaster and asked for a recommendation for a diver, as I struck out trying to find one on the 'net, and confirmed that they still allowed two free nights on their transient mooring balls (they do). 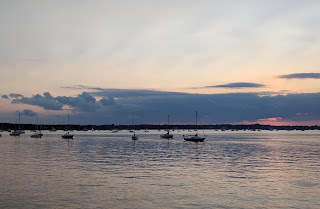 Sunset over Manhasset Bay. Vector is to the left. We arrived in Port Washington to find all the transient balls taken. Weather in the sound was pretty choppy, so lots of folks took shelter. We dropped the anchor alongside the mooring field and tendered ashore to one of three free dinghy docks to pick up some groceries and grab dinner. We ate at the pizza joint next door to the grocery, which we were happy to find matched our memory that it was good and inexpensive. What a contrast from Port Jeff. This harbor is very cruiser-friendly and welcoming. It's also convenient to services, with a major grocery store, an Ace Hardware, a West Marine, a gas station, and a dozen restaurants all within dinghy/walking distance. There is also a pumpout boat in the harbor, which is what prompted our very first stay here. 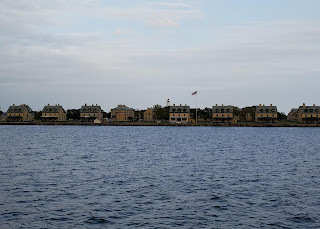 As I wrote in that post, this bay was the setting for The Great Gatsby, and there is no more a shortage of wealth here than in Port Jeff, but the attitude is night and day. Wednesday was a gorgeous day and most of the free moorings cleared out by mid-day. Before we had a chance to move (just to be a tad closer to the town landings), the divers showed up to give us a quote. Things were worse than we thought, and divers are very expensive in Long Island Sound, but they were ready to start right away so we bit the bullet and had it done. Unfortunately it seems most of the bottom paint we just had applied in February came off with the growth, and we will need a haulout and painting soon. As soon as the divers left, we weighed anchor and moved to a free mooring closer to town (map). The divers had originally figured to quote on Wednesday and then come back Thursday to clean. Since they did it all in one shot, we looked at the weather and decided we'd leave first thing in the morning, catching a favorable tide through New York City and out to the Shark River in NJ. Then we'd head to Atlantic City today for a two-night stay, catching the best and last of the offshore conditions Sunday to get around into Delaware Bay. I emailed my folks to suggest we could drive up from Atlantic City for a visit on Saturday, and I was all set to book a car. 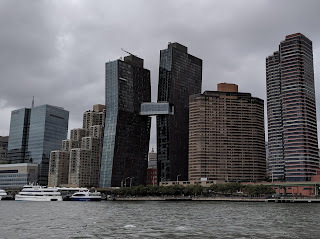 This pair of new condo buildings on the east side of Manhattan look like they're mating. Not a half hour after I sent the email, and while I was online looking at car rentals, Red Cross HQ called to ask if I could take an assignment to North Carolina for the Florence response. I could not answer right away because we needed to figure out where, if anyplace, we could leave the boat while I was away. I told them I'd call back in an hour. Marinas in this part of the country are ridiculously expensive. Dockage with power for Vector starts around $175 per night and goes up from there. I love the Red Cross and I really want to help, but $2,800+ out of our pockets for a two-week deployment is really out of the question, especially since we can't even take a deduction for it. I did leave a couple of messages for marinas in the event one would like to make a donation of a slip for the two weeks; I'm pretty sure I could get the local in-kind donations person to write them a receipt and letter. At some point it occurred to us that we were already in the perfect spot. Mooring balls here are just $25 per night, and that includes launch service from 8am to 10pm. Louise would have to run the generator as needed, which right now is a lot, since the batteries are shot and overdue for replacement. Even at four hours per day, that's still just another $8 or so per day. And, as I just noted, there are plenty of groceries and other services here to get her through a couple of weeks. I called HQ back and accepted the assignment. Within a couple of hours my paperwork came through, and by the end of the evening I had flight reservations out of LaGuardia for Raleigh this morning. I called the Water Taxi company, who runs the paid mooring balls, explained the situation, and he assigned us an available ball where we could move Thursday (the free balls, one of which we were now on, are in a separate area). We also got an address from them where we could have our mail sent and Louise could get a couple of packages while she was stag for the duration. 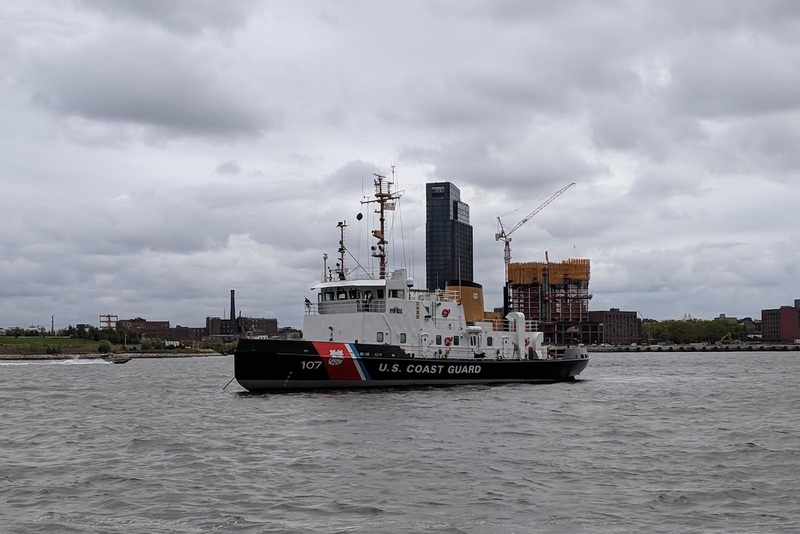 The USCG cutter Penobscot Bay was anchored in the East River just south of Roosevelt Island. She had her blue lights flashing and 50-caliber machine guns mounted and ready. For what? Before we realized we'd have one more night together, we went for a nice "final" dinner at Ristorante Toscanini in town. Yesterday we moved, for the second time in as many days, from the free ball to the paid one (map). Then we went to the bank, the gas station to get her spare fuel for the tender, and Target to pick up some last-minute items I'd need on deployment, like bug spray. Louise drove the new tender for the first time, getting some practice in for my absence. While we were in Target, an email arrived changing my assignment. I won't bore you with the minutiae that are probably only interesting to other Red Crossers, but suffice it to say they wanted me to accept a role that is outside my normal skill sets. The deployment database is not supposed to even allow that (my primary skills are on record), but apparently because I am high enough up the chain that can be overridden -- and it was, without asking me. It costs a lot of donor money to transport, house, feed, and care for a volunteer in a disaster area, and it costs us personally a lot of money for me to go on deployment, not to mention all the other disruption. And that all makes sense and is worthwhile if I am the right person for the job. But after the assignment change that was no longer the case, and I felt compelled to decline the new assignment, for the good of all concerned. I spent the rest of the day and evening in a rather dejected mood. Mixed with annoyance; someone (actually, probably more than one someone) dropped the ball big-time in not having assignments sorted out ahead of time. It cost the operation precious time waiting for a properly skilled volunteer, who now still needed to be recruited, and it cost us in lost time, missed windows, and actual cash to scramble for deployment only to wave off a day later. An iconic view. Lady Liberty is visible under the Brooklyn Bridge (behind the Manhattan Bridge); One World Trade Center is at far right. Over a casual dinner in the bar at local fixture Louie's, we hashed out what to do from here. Louise had already requested our mail be sent, and it had left Green Cove Springs before we could stop it (she was, however, able to stop an eBay order from shipping). We had given up our second free mooring night in favor of a paid ball. And we were too late to depart for NJ and still have time in Atlantic City for a visit. 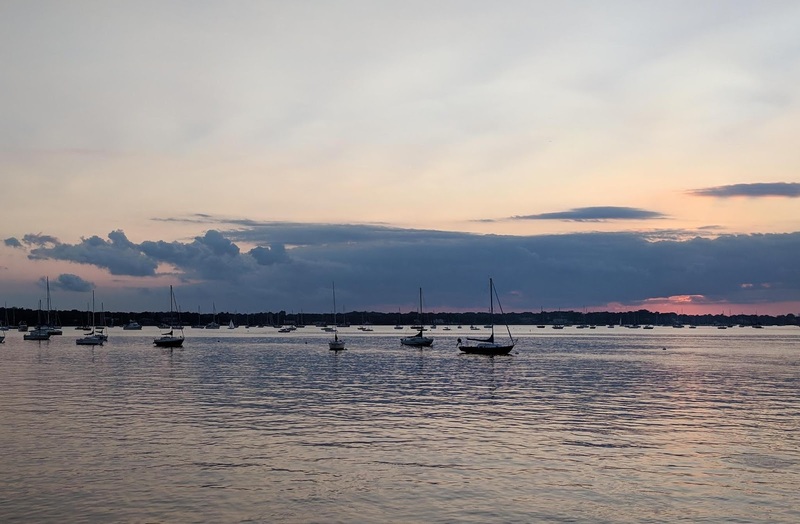 As nice as Port Washington is as a cruising stop, we really did not want to miss the rest of this weather window just to wait until Monday for our mail, nor did we want to rack up a hundred bucks in unnecessary mooring fees. So we decided to just ask the mooring guys to refuse our package, which will send it back to our mail service, and paid them for the single night on the ball. At least we used the launch service to go to dinner and back. This morning we dropped lines early and whizzed through New York at an average of nearly nine knots, with the swift hydraulic current of the East River behind us. We were doing 11 through Hell Gate. 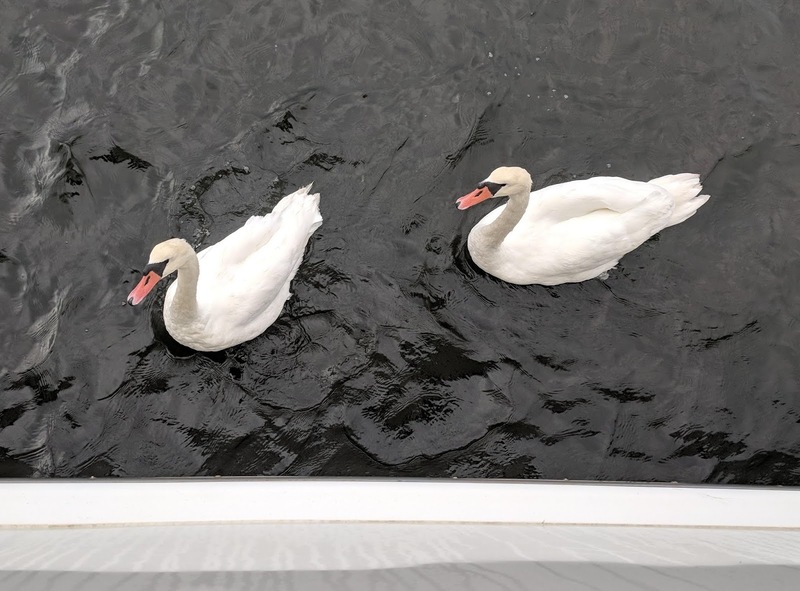 We were on schedule for an arrival in the Shark River before 5pm, and looking forward to maybe landing the tender at the new dock we spotted on our last visit and going ashore for dinner. All was well and good until we left New York Harbor via the Ambrose Channel. By the time we reached Romer Shoal we were bashing into steep, short-period five footers on the nose, heaving every item in every locker up and down with each pitch. So much for a forecast of three to four on nine seconds. Tonight's view. Sandy Hook Light, the oldest working lighthouse in the US, behind "officer's row" of old Fort Hancock. Reluctantly we turned west after clearing the shoal, making our way to the Raritan Channel. I had to drop speed down to just four knots to keep the pitching reasonable until we were in the lee of the northern shore of the Hook. We curled around the corner to the Coast Guard station and dropped the hook here, just abreast of Sandy Hook Light. Tomorrow's forecast is worse than today's, so it looks like we will be pinned down here until Sunday, when, if the forecast holds, we get a one-day break and can make a run for it as far as Atlantic City. We'll know more in the morning. If it looks like our window has slammed shut entirely, we might make our way back to Manhattan via the Arthur Kill, just as a more attractive place to wait it out. If it will only be two nights, we'll probably wait it out right here. This is a closer launching point for the run to Atlantic City, and we have plenty of provisions. As it stands now, it's a one-day window, which means we might be there a few days until the next one opens. At least we can get in that family visit, and there are plenty of services an easy ride from the anchorage there. As usual we are enjoying reading about your travels. We were in NYC 2 years ago doing the tourist thing. One day we took the Staten Island ferry back and forth. On the return trip to Manhattan we were followed by a big USCG RHB. There was a .50 cal gun mounted on the deck with a young sailor manning it ready to shoot. The RHB zigzaged astern of us 200ft in our wake. This was of immense interest to me and our party. When we were almost back to Battery Park 4 guys on 4 seadoos come from the East River area making a bee-line for our ferry at top speed. The next second the RHB gunned the engine and made a bee-line for them, blasting the siren and a loud hailer shouting for them to veer off and heave to. Three of them did tout suite but of course one of them kept on coming, as this drama unfolded I was hoping said young sailor would put a burst of fire across the seadooers bow but no such luck. He eventually pulled over and the USCG had a wee chat with him I would guess. All very exciting never the less. Have you read Nelson DeMilles book Radiant Angel Sean? Great read about nefarious goings on with a boat, a bomb, on Long Island and NY harbour areas.